Obesity and high physical workload are both associated with poor work ability, but the interaction between obesity and high physical workload on work ability is not yet fully understood. Obesity and high physical workload may share a common mechanical pathway, possibly leading to a synergistic negative effect on work ability. The purpose of this study was to investigate the effect of obesity on work ability in workers with high versus low physical work load. A longitudinal study was conducted among 36,435 Dutch construction workers who participated in at least two periodic medical examinations during the years 2008–2015. Logistic regression analyses were used to investigate the effect of manual material handling and strenuous work postures in sports on the association between obesity and work ability. Work ability was measured using the self-reported Work Ability Index consisting of seven dimensions. Confounding effects were tested for age, educational level, smoking, vigorous physical activity, psychosocial work demands, and working hours. Additive interaction between obesity and physical workload on work ability was tested using the relative excess risk due to interaction (RERI). Construction workers with overweight (OR = 1.09; 95% CI 1.02–1.16) or obesity (OR = 1.27; 95% CI 1.17–1.38) had an increased risk of poor/moderate work ability. 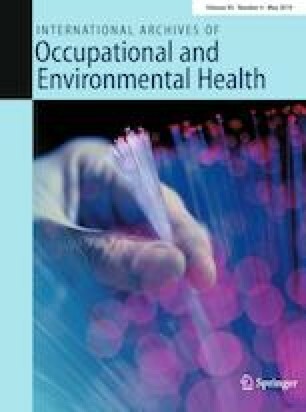 Exposure to manual material handling (OR = 1.58; 95% CI 1.49–1.68) or strenuous work postures (OR = 1.80; 95% CI 1.70–1.90) also increased the risk of poor/moderate work ability. The effect of the combination of obesity with high physical workload was greater than the sum of the individual effects (strenuous work postures: RERI = 0.39; 95% CI 0.10–0.67; manual material handling: RERI = 0.26; 95% CI 0.02–0.51). Obesity and high physical workload were associated with poor work ability and had a synergistic, negative effect on work ability. Interventions that prevent obesity and high physical workload might have a beneficial effect on work ability. We thank the construction workers for their contribution and Arbouw/Volandis for the collaboration. The Netherlands Organization for Health Research and Development (ZonMw) partly funded this study (Project number: 531005004). The funder was not involved in determining the study design, the collection, analysis or interpretation of the data, in the writing of the report, or in the decision to submit the paper for publication. Respondents gave consent to use their data for scientific purposes upon completion of the periodic medical examination questionnaire.